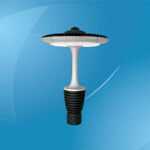 Submersible LED lights are compact illuminative devices used primarily as enhancements for water-based ornamentations. The energy efficiency, portability and stunning aesthetic appeal have turned them into one of the most crucial decorative elements for indoor ornaments and fixtures, aquariums, ponds, fountains and glass designs. Although commercial LED products has been around from as early as the 1960s, it was only recently that submersible LED lights evolved into one of the most sought-after design choices for homes, social events, clubs, restaurants and weddings. 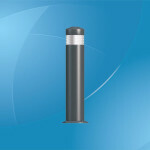 The smaller variants are also increasingly used in favor of candles and gas lanterns owing to fire codes requirements and safety considerations. SLLs can be used in fresh water at any submerged level, ideally placed on a flat surface or suspended firmly. It should not be used in salt water, as the corrosive effect could compromise the integrity of the insulation or protective mechanism, and introduce the risk of electrocution. For optimal performance, water temperatures should preferably be in the 35 Fahrenheit and 95 Fahrenheit range. 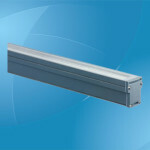 The LEDs inside the SLLs will cease to function in extremely cold and warm weathers. While attempts have been made to use fluorescent and neon lights, the average 5,000 to 100,000 hour lifespan and efficient power consumption of LEDs have made them the automatic choice for most submersible light manufacturers. Moreover, the electroluminescence process, which grants semiconductor chips their light-emitting properties, minimize production requirements for manufacturers. The massive drop in prices of LED at the turn of the 21st century, along with its low power supply requirement (around 10mW to 3W) and higher shock tolerance have all effectively cemented its long term viability in the industry. 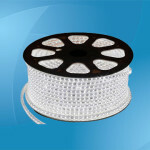 Unlike LED casings which typically use a combination of aluminum reflectors and transparent glass, submersible LED lights use only lightweight and transparent plastic or tempered glass that provides 360 degree illumination. In addition, these casings are designed to be water-tight, and able to withstand mild pressure (at depths of between four and six feet). 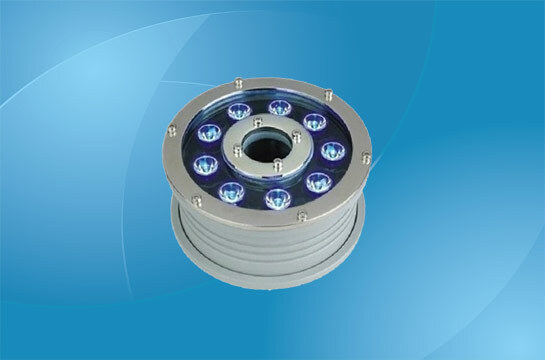 While gallium nitrate, gallium arsenide, Yttrium aluminum garnet and other semiconductors are capable of providing LEDS with a wide range of colors, these casings are usually tinted to provide an ever wider variety of colors and depth. Submersible LED lights are powered by either replaceable batteries or AC adapters/transformers. Smaller-sized submersible LED lights regularly use button cell lithium batteries (CR2032/lithium-manganese dioxide and BR2032/lithium-carbon monofluoride) as a power source. Depending on the settings and SSL device, these disposable batteries can last anywhere between 4 and 70 hours. 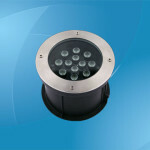 Larger submersible LED lights are powered directly by adapters. In instances where longer wires are required, the adapters are augmented with transformers to generate a consistent level of power supply. These units typically have 120VAC/60Hz outputs. 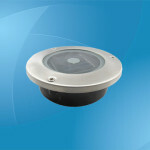 Photocell Timer – For smart energy and budget-conscious users, a number of submersible LED lights offer light-sensitive photocell timers. This ensures that the LEDs only spark into life in the absence of sunlight and winds down at dawn when the morning sun appears, a feature especially useful for SLLs placed inside large water structures. 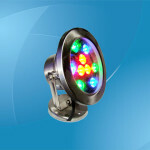 Multicolored Lenses – Submersible LED lights routinely come with extra multicolored lenses that can be easily swapped with the original white ones. This feature provides users with the ability to instantly change the look and mood of any environment, at no additional costs!